Citation Information: J Clin Invest. 2005;115(2):227-230. https://doi.org/10.1172/JCI24269. In pancreatic β cells, not only insulin exocytosis per se, but translocation of β granules toward the plasma membrane — an event upstream of exocytosis — are under the control of glucose. However, the molecular basis of this translocation has been poorly understood. Rab27a-mediated translocation of glucose-induced β granules is reported in this issue of the JCI. Rab27a or its effector molecule may constitute a novel pharmacological target because potentiation of the Rab27a pathway is expected to restore β cell glucose competency in patients with diabetes mellitus. Metabolism-secretion coupling within the pancreatic β cell. (A and B) Elevation of ATP and ATP/ADP is the starting point for KATP channel–dependent signaling, which has been well elucidated, as shown here (6). Owing to [Ca2+]i elevation, fusion of β granules in the RRP and the plasma membrane takes place, and this results in the first phase of glucose-induced insulin secretion. The molecular basis for KATP channel–independent signaling (B) is not fully characterized. The end point of this signaling is expansion and/or replenishment of the RRP, after which a second phase occurs in which insulin release gradually increases. Upon glucose stimulation, KATP channel–dependent and –independent events take place. When an experimental protocol to detect time-dependent potentiation is employed (16, 17), expansion of the RRP can be quantified. Membrane fusion of the β granules in the RRP is required and sufficient for first-phase insulin release, and, in addition, expansion and/or replenishment of the RRP is required for second phase release (see Figure 2). As shown in A, as a result of anaplerosis (2), increased citrate flux (2) and/or activation of acetyl-CoA carboxylase (ACC) (3) occurs, which results in expansion and/or replenishment of the RRP via the series of events indicated (10–12). Cytosolic flux of glutamate, by virtue of its uptake by β granules, sensitizes the granules for fusion (15). 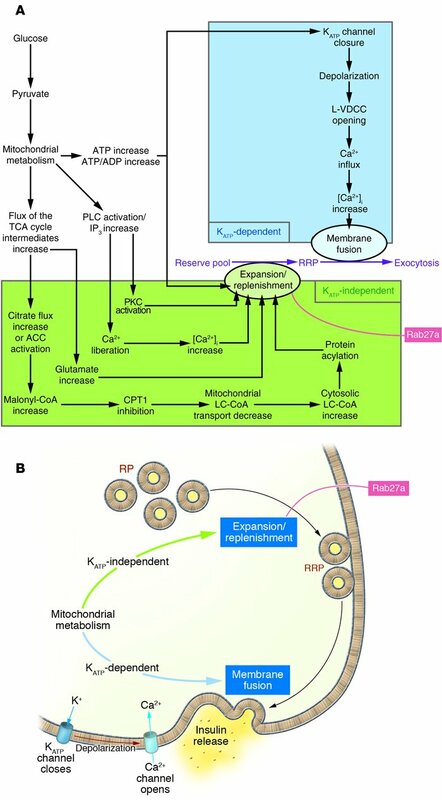 Activation of phospholipase C (PLC), PKC, or an increase in inositol trisphosphate (IP3) (4) and liberation of stored Ca2+ (13) also yield expansion and/or replenishment. ATP itself (14) and elevation of ATP/ADP (9) are also involved in this process. In this issue of the JCI, Kasai et al. (1) report that Rab27a plays a critical role in replenishment of the RRP. CPT1, carnitine palmitoyl transferase 1; L-VDCC, L-type voltage-dependent Ca2+ channel.